Below, a split system air source heat pump with the outdoor and indoor portions in separate locations. The interior unit in a split system can reside in a closet (vertically) or it can be slung below floor joists in the crawl space in addition to the attic. This graphical excerpt comes from 1977 technical literature from Carrier Corporation. It was installed in Bill's house that year. Air source heat pumps do a good job of providing winter heat (depending on proper sizing like all mechanical heating and cooling equipment). At moderate temperatures they are very efficient. They are less so at winter lows. The standard efficiency tests for such units are at outside air temperatures of 47.5°F and 17°F. They will keep you warm at either temperature, but your run-times will be longer in colder weather. All heat pumps should have supplemental electrical resistance heat (noted in the diagram above as "40FQ ELECTRIC HEATER"). 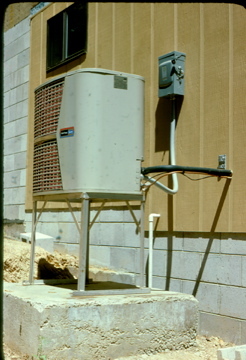 Outdoor unit of Carrier 4-ton split system heat pump. Indoor portion of Martin's '77 air-to-air heat pump. It contained a humidifier, electric resistance strip heat, electronic air filter, and a solar contribution A-coil (never used). A subsequent owner converted this system to a ground source type in the late '90s.